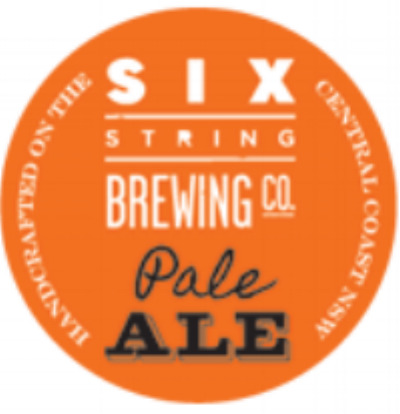 Proudly the Central Coasts first home grown craft brewery, Six String Brewing Company is 100% locally owned, making and packaging all our beer right here onsite. All our beers are preservative free with no additives and no substitutes used. They are unpasteurised and unfiltered, giving the fullest possible flavor to our range. 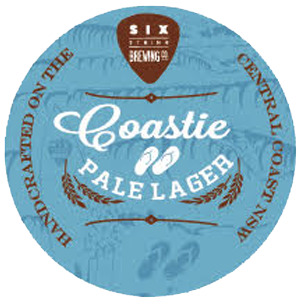 Our award wining core range has 4 beers; Coastie, specially brewed for the Central Coast fitting right in to the beach lifestyle so synonymous with the Central Coast, Golden Ale, Pale Ale and Dark Red IPA. We are passionate about producing full flavoured or as we like to call them Amplified Ales and are continually brewing up something new, different and often out of the box of your standard beers. These are what we call our seasonal beers, they are often one off brews, sometimes one off kegs always limited edition and never dull. Hover over the images below for more information. Available exclusively through Redwood Distribution. The beer itself uses Summer hops designed to give aroma of melon and lemon myrtle while a touch of dry hopping with the same variety gives a slightly sweet finish that complements a breadiness from the malt. At 5 percent ABV and a mere 12 IBUs of bitterness, it's pretty easy to imagine what this beer is like and the sweet spot it can hit as you pull up to the bar having spent the day in the sun. And, since they popped it in cans and sent the beer far and wide, you can bet that it's hitting a lot of sweet spots. As you might expect from a beer that's a hybrid between American and Australian Pale Ales, this beer does its stock and trade on fruity and floral hop characters. But, really, in this day and age it seems you can't go and release a Pale Ale without having it loaded with hops - you'll be laughed out of the brewery. No chance here though; hops from the two countries give a heap of passionfruit, mango and citrus aromas. But it's not all in the head. While the beer has been designed to have a clean and dry finish, over the top of the malt you get the hop characters coming through again. That helps add bitterness which contributes to a refreshing beer that doesn't lack for flavour. The best way to sum up this beer? It's just feels really good to drink. It's not red. Or is it? What at first seems like another easy classification as a black IPA gets mighty confused when you hold it up to the light because, yes, there's definitely redness there. And as there would be because the recipe is based very loosely on the West Coast USA style red ale, tweaked and nudged until it's become Six String's signature beer. The red colour here comes from rich caramel and chocolate malts, which also give off a contrasting creamy white head. Once you've stopped looking at it and get it close to your face, you'll get the hops, hops, hops. They've been added late in the brewing process; at the end of the boil, in the whirlpool and dry hopping during fermentation. Yet, despite the heavy hopping regime, between those big malts and the big hops it's a balanced beer. You could argue it keeps its balance a little too well. At 6.6 per cent ABV, you might even say it sneaks up on you.